New ListingBoxing Illustrated Wrestling News - Lot of 9 Magazines 1963-1966- Cassius Clay! Boxing Illustrated Wrestling News - Lot of 9 Magazines 1963-1966. The JUne 7, 1965 issue of SPORTS ILLUSTRATED. Cassius Clay (Muhammad Ali) and Liston fight on cover. Contains close up look at the famous "phantom punch. "Good plus condition with full covers and pages. This is the July 4, 1988 issue. 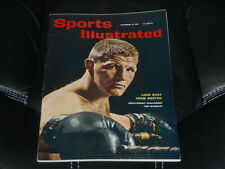 March 1962 The Ring Boxing Magazine - 40th Anniversary Issue. #36 FEATURING BETULIO GONZALEZ ON THE COVER APRIL 27, 1973. THE MAGAZINE HAS BEEN IN A PROTECTIVE MAGAZINE SLEEVE FOR THE PAST 35 YEARS. THE RING MAGAZINE JOE FRAZIER AND MUHAMMAD ALI BOXING HOFers ON THE COVER FEBRUARY 1992. LOT #1483. THIS IS THE "70th ANNIVERSARY COLLECTOR'S EDITION" ! THIS MAGAZINE IS IN UNREAD NEAR MINT CONDITION WITH A TIGHT BINDING, NO CUT OUTS OR WRITING. BOXING DIGEST MAGAZINE LOT of 9. Great Covers, Mosley, Morales, Jones, Klitschko, Foreman, Barrera, Trinidad, Lennox Lewis, and a lot more. June 15 - July 15. Tyson vs. Spinks. Vintage Sonic Gary Payton Lunch Box. The box is in awesome shape looks almost brand new. No dents or deep scratches or rust. A real must for any sonic fan. Heavyweight champion Rocky Marciano on the cover of News Weekly Quick Magazine. 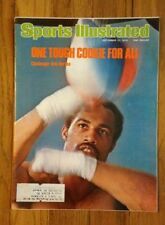 MOUTHPIECE AMATEUR BOXING MAGAZINE FEATURING ROBERT SHANNON 1980-1984 OLYMPIC BOXER ON THE COVER JULY-SEPTEMBER 1984. LOT #1511. 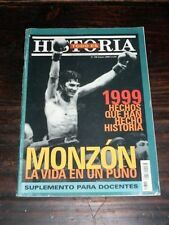 A RARE AND VERY COLLECTABLE MAGAZINE FOR EVERY BOXING HISTORIAN, AVID FAN OR SERIOUS COLLECTOR AT A GREAT VALUE PRICE ! Nice old Ring Magazine April 1981. In great shape...as if it was right off the shelf. BOXING COLLECTORS NEWS MAGAZINE FEATURING BRONZE BOXING STATUES ON THE COVER ISSUE #247 JULY-AUGUST 2009. LOT #8526. 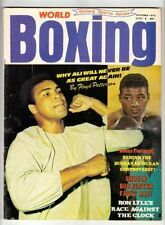 THIS BOXING COLLECTORS NEWS MAGAZINE IS IN NEAR MINT CONDITION WITH A TIGHT BINDING, NO TEARS, CUT OUTS OR WRITING. This auction is for a very nice copy of Complete Records of World's Heavyweight Boxing Champions Illustrated. Contains pictures and records of all the great Heavyweight champions from 1882 to 1941. A rare and very hard to find 5 1/2" x 7 1/2" soft cover magazine. Check out the pictures for condition and my feedback and buy with total confidence Please check out my other auctions for other great Boxing collectibles and memorabilia, and many other great items. Buyer will get Free Shipping in the USA. Thanks so much for looking, and good luck with your collecting interests. Take care, Tom. GREAT MAGAZINE FOR FANS OF BOXING WITH CANELO V JACOBS ON THE COVER. VERY COLLECTIBLE MAGAZINE. MAGAZINE IS COMPLETE AND HAS NOT BEEN BROWSED THROUGH. BOXING COLLECTORS NEWS MAGAZINE FEATURING SAM LANGFORD BOXING HOFer ON THE COVER ISSUE #211 MARCH 2006. LOT #8490. THIS BOXING COLLECTORS NEWS MAGAZINE IS IN NEAR MINT CONDITION WITH A TIGHT BINDING, NO TEARS, CUT OUTS OR WRITING. Both in very good condition, minor wear, few spots, didn't see tears or writing. 1974 in very good condition, 1973 in fair condition -- no tears in pages of either. New ListingThe Ring Boxing Magazine July 1986 Spinks v Holmes: Who Really Won? GREAT MAGAZINE FOR FANS OF BOXING WITH TERENCE CRAWFORD ON THE COVER. VERY COLLECTIBLE MAGAZINE. MAGAZINE IS COMPLETE AND HAS NOT BEEN BROWSED THROUGH. KO Boxing Magazine With Center Poster, Sugar Ray Leonard Sept. 1987. This magazine is loaded with articles and pictures on boxing. This magazine is in Excellent to Near Mint Condition. Please see photos. This lot includes: Boxing Yearbook (1963 Edition) ; ; The Ring (July 1965 ); The Ring (October 1969); Boxing Illustrated (September 1970); World Boxing (June 1972); International Boxing (August 1980). 1974 January BOXING RECORD Magazine JOE FRAZIER. SPORTS ILLUSTRATED withNO LABEL, Newsstand Copy. No Exceptions! 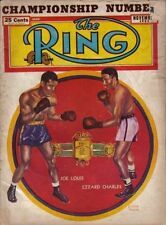 Complete January 1 9 3 6 T H E RING boxing magazine. No real stains inside, but typically fragile with minor chipping. Boxing Illustrated Wrestling News - Lot of 9 Magazines 1963-1966- Cassius Clay! Vintage magazines come in many different types, styles, and topics including boxing magazines. Each of these issues showcases a different era of boxing and can be used to trace its changes through the years. What information is available in each boxing magazine? 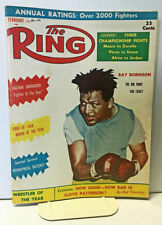 Boxing magazines such as The Ring and Boxing News devoted a lot of time to a variety of topics. For example, they would talk about a fighter training for an event and showcase their training regimen. Issues would also discuss any changes in that fighter's life and promote upcoming events. Beyond that, they would also take a look at old championship bouts and even examine day-to-day boxing news. These vintage magazines also serve as a reminder of historical moments in boxing and provide a vintage look at what happened in the ring at the time. Are commemorative boxing magazines available? Boxing is a sport that is often focused on a few critical fighters and events. As a result, magazines such as The Ring and Boxing News have commemorative issues highlighting specific events. For example, most fights that featured Muhammad Ali featured coverage from these vintage brands that featured in-depth examinations of the upcoming battle. Issues of these type typically focused on the boxers in the fight and showcased their past successes. Often, they would discuss any bouts they may have had in the past and even showcase where they came from in the world. These vintage magazines usually came out several days before the event to highlight it and drive up hype. What materials are used in these boxing magazines? Vintage magazines use a variety of paper types. Typically, most vintage books used thin, delicate paper to save on production costs. However, other types of boxing books used stronger and more resilient types of paper that helped to make these vintage items last longer than other magazines on the market. Beyond the paper used, a variety of inks were injected on the paper. Most boxing magazines used vintage carbon inks. These types were designed to avoid the kind of fading that plagued some vintage boxing magazines of the time. However, some may use iron gall ink, a kind that requires specialized storage in a stable environment. For example, they need room temperature and normal humidity to avoid damage when stored. In what ways do these books vary? While it is possible to buy boxing books from many vintage providers, there are subtle variations between different types. For example, some media guides showcase a fight and give sports reporters a chance to know what is happening at an event. However, there are also various vintage programs and yearbooks produced that highlight specific events. Yearbooks typically compile multiple events and give an overall feel for what happened in the world of boxing. Programs are specific to a particular bout and highlight interesting facts about it.